But that’s not the point of this post. It’s more to buttress the pace at which technology changes. 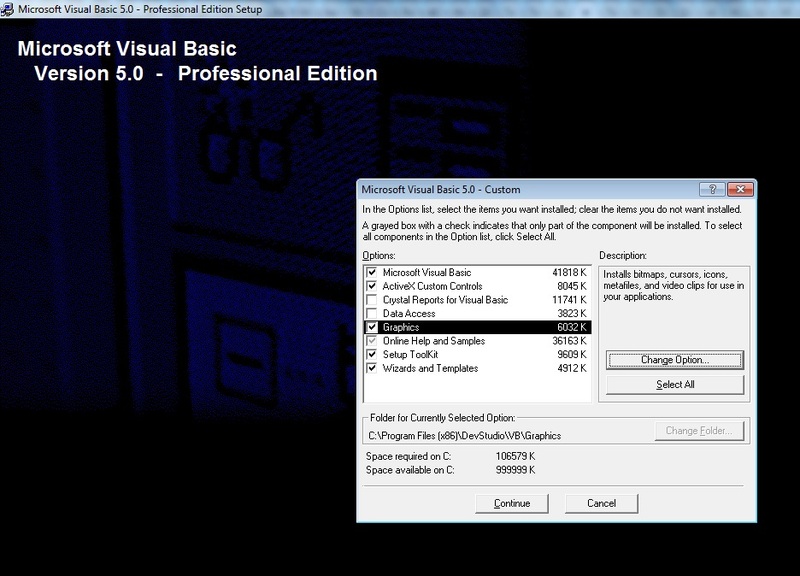 I found Visual Basic 5 on the freedownloadmanager.org website under the Windows abandonware section and installed it on my system. During the installation, I came to the component selection screen below and was drawn to the meagre disk space requirement (compared to the multi-GB requirements of some newer coding platforms). I am not berating the programmers: I just wanted to use it to point out the rapid pace of technological development. The laptop I installed it on had a 476GB Hard Disk Drive (HDD) with 131GB free space. Since that field in the installer was expressed in KiloBytes (KB), they would have required 9 digits instead of the 6. People code smarter now of course. “Human-friendly form” would result in the value been converted to GB or TB (etc) which reduces the field’s required number of digits. And the VB5 IDE was just 20 years ago. Of course in computing, that’s another era/lifetime. End Note: Bill Gates has always denied ever making the statement above. So why didn’t I remove it? Some things are part of computing lore. That quote is one of them.